FringePop: We Did It for Love! When I first saw this vintage exploitation poster (1959), I thought that it was scandalizing kids who married too young. Then I thought about it a little further and thought, "Wait...I really don't think marrying young was as big of a deal back then." My own mom married at 19, and I don't think she was looked at as remotely too young. Of course, she was out of high school. 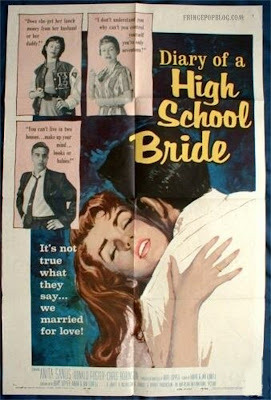 When I looked closer, though, I saw that the teenagers on the poster are having to defend their marriage by saying, "It's not true what they say...we married for love!" Then the bells rang in my head, and I understood. Okay, so what we've got here is an iconic 50's stereotype: the unwed mother who gets married to cover up a pregnancy, and they have to fudge the details of the pregnancy timeline. Lie and say the baby was premature when the dates don't add up. That sort of thing. Anyway, I come from a very conservative, rural community, and I personally know people who had to do this. I'm sure this happens occasionally today, but I would guess only in really conservative communities. So, this is a pretty iconic representative of 50's morality. I apologize for the lower picture quality than I usually post. It's harder to get a good quality picture with my camera, which I have to use since this can't fit on my scanner.